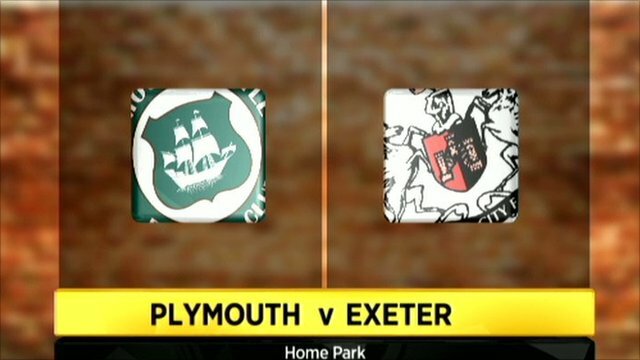 Substitute Daniel Nardiello's late goal put Exeter through to the Johnstone's Paint Trophy area semi-finals at the expense of Devon rivals Plymouth. 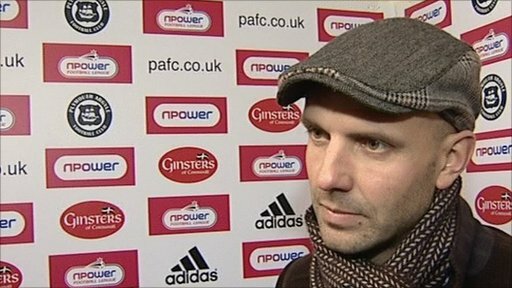 Ryan Harley gave Exeter the perfect start by firing past Argyle keeper Romain Larrieu inside two minutes. Argyle's Chris Clark levelled after the break with a speculative 40-yard lob. But, having been on the pitch for less than nine minutes, Nardiello struck from inside the area deep into injury time to put the Grecians through. In the first meeting between the two sides for eight-and-half-years, Exeter's Harley stunned the vibrant home support with his second-minute goal. Harley's strike was a perfectly placed shot from the edge of the box, beating Larrieu to his right hand side. No excuses from this corner, Exeter were the much better team and fully deserved their victory. Fired up, Exeter enjoyed the better of the first half, with Plymouth proving wasteful, particularly in the final third. Harley could have made it two on 35 minutes, but his shot from the left was well saved by a diving Larrieu. But six minutes into the second half and Argyle were back on level terms. A poor clearance from Grecians' keeper Artur Krysiak fell kindly to the feet of midfielder Clark, who sent it straight back over his head. After 60 minutes, Exeter striker Jamie Cureton had a golden opportunity to put his side back in front, but the 35-year-old steered the ball wide when having a clear sight of goal. With the clock running down, both teams pushed for the winner, Craig Noone coming close for Plymouth, and Richard Logan shooting narrowly wide for City, as both sets of fans sensed victory. But it was Nardiello who kept his composure as the temperature rose. Having been put through by Logan, the replacement skilfully evaded Plymouth's retreating defence to put the ball low into the left-hand corner of the net to the delight of the visiting fans. 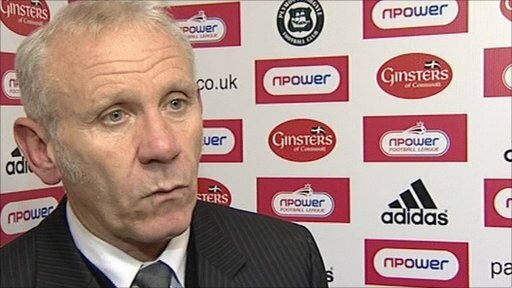 "We haven't seen it through - I think we had comfortable possession, but instead of putting the ball down the sides we lost possession and got caught with a sucker punch. "We gave the ball away in too many comfortable positions so that was disappointing, but we live to fight another day. "It was a terrific atmosphere and we're very disappointed, but we'll have to swallow it, and it's about how we bounce back now. "I've got some good players and I've got some players that I need to move on, that's just a fact of life. I'm enjoying he challenge, but I'm disappointed with tonight's result." "I think we created enough chances not to be too grateful for that last-minute chance. In the second-half especially we had a lot of pressure and numerous half-chances. "Daniel is likely to score at any point, he has a real eye for goal. I'm very pleased for him and the supporters. "I'm delighted we didn't concede the goal and feel despondent, we actually upped our game, and had the better of the last quarter. "We have to be very pleased with ourselves but we have to keep the balance right, as we have to come back here in a month to play in the league." 90:00+3:32 The match has reached full-time. 90:00+2:17 Assist by Richard Logan. 90:00+2:17 GOAL - Daniel Nardiello:Plymouth 1 - 2 Exeter Daniel Nardiello scores a goal from inside the penalty area to the bottom left corner of the goal. Plymouth 1-2 Exeter. 90:00+1:06 Bradley Wright-Phillips challenges Richard Duffy unfairly and gives away a free kick. Artur Krysiak takes the direct free kick. 89:50 Short corner taken by Craig Noone. 89:17 Craig Noone takes a shot. Save by Artur Krysiak. 88:30 Craig Noone gives away a free kick for an unfair challenge on Billy Jones. Ryan Harley delivers the ball from the free kick right-footed from left wing, save by Romain Larrieu. 86:57 Inswinging corner taken by Yannick Bolasie from the left by-line, Foul by Bondz N'Gala on Troy Archibald-Henville, free kick awarded. Artur Krysiak takes the free kick. 85:00 The assistant referee signals for offside against Daniel Nardiello. Marcel Seip restarts play with the free kick. 84:05 The referee blows for offside against Jamie Cureton. Indirect free kick taken by Marcel Seip. 84:05 Substitution Jamie Cureton goes off and Daniel Nardiello comes on. Correction - 82:09 The offside flag is raised against Joe Mason. Artur Krysiak restarts play with the free kick. 82:09 The assistant referee signals for offside against Joe Mason. Artur Krysiak restarts play with the free kick. 79:28 Free kick awarded for a foul by Troy Archibald-Henville on Onismor Bhasera. Romain Larrieu takes the free kick. 78:47 Outswinging corner taken by Billy Jones from the left by-line, Marcel Seip manages to make a clearance. 78:08 Outswinging corner taken left-footed by Billy Jones from the left by-line, clearance by Marcel Seip. 77:33 Substitution Marcel Seip replaces Curtis Nelson. 76:17 Substitution Joe Mason is brought on as a substitute for Rory Fallon. 75:31 Corner taken left-footed by Craig Noone from the right by-line, Header by Rory Fallon from deep inside the penalty area misses to the left of the goal. 74:51 Corner taken right-footed by Yannick Bolasie, clearance by Richard Logan. 73:40 Corner taken by Billy Jones from the left by-line, Headed effort from deep inside the area by Troy Archibald-Henville misses to the right of the goal. 73:18 Jamie Cureton takes a shot. Save by Romain Larrieu. 69:18 The referee penalises Bradley Wright-Phillips for handball. Troy Archibald-Henville takes the free kick. 68:52 Effort from the edge of the area by Liam Sercombe goes wide of the left-hand upright. 68:26 Outswinging corner taken from the left by-line by Billy Jones. 68:06 Craig Noone takes a shot. Save made by Artur Krysiak. 64:43 Free kick awarded for a foul by Rory Fallon on Billy Jones. Billy Jones takes the direct free kick. 61:08 Jamie Cureton produces a left-footed shot from deep inside the penalty box which goes wide of the left-hand post. 58:28 Karl Duguid challenges James Dunne unfairly and gives away a free kick. Billy Jones takes the direct free kick. 56:54 Steve Tully challenges Yannick Bolasie unfairly and gives away a free kick. Yannick Bolasie delivers the ball, Rory Fallon has a header from close range and clears the crossbar. 56:54 Booking Steve Tully booked. 53:26 Outswinging corner taken left-footed by Billy Jones from the left by-line to the near post, clearance made by Chris Clark. 51:05 GOAL - Chris Clark:Plymouth 1 - 1 Exeter Chris Clark finds the net with a goal from long distance to the bottom left corner of the goal. Plymouth 1-1 Exeter. 49:27 The referee blows for offside against Jamie Cureton. Free kick taken by Romain Larrieu. 48:33 Karl Duguid takes a shot. Save made by Artur Krysiak. 47:11 Ryan Harley takes a shot. 46:08 Foul by James Dunne on Conor Clifford, free kick awarded. Direct free kick taken by Romain Larrieu. 45:46 Richard Duffy fouled by Rory Fallon, the ref awards a free kick. Direct free kick taken by Artur Krysiak. 45:00+2:12 The ref blows to signal half-time. 45:00+0:55 A cross is delivered by Craig Noone, save by Artur Krysiak. 42:46 The offside flag is raised against Jamie Cureton. Indirect free kick taken by Bondz N'Gala. 40:54 Outswinging corner taken by Billy Jones from the left by-line, Troy Archibald-Henville takes a shot. 39:55 Outswinging corner taken right-footed by Ryan Harley from the right by-line to the near post, clearance by Craig Noone. 37:00 Unfair challenge on Bradley Wright-Phillips by James Dunne results in a free kick. Romain Larrieu restarts play with the free kick. 35:43 Rory Fallon fouled by James Dunne, the ref awards a free kick. Karl Duguid restarts play with the free kick. 34:36 Inswinging corner taken left-footed by Craig Noone played to the near post, Billy Jones makes a clearance. 34:01 Inswinging corner taken by Yannick Bolasie from the left by-line, clearance made by Richard Duffy. 33:43 Craig Noone takes a shot. Blocked by Troy Archibald-Henville. 32:41 Bradley Wright-Phillips fouled by Richard Duffy, the ref awards a free kick. Direct free kick taken by Bradley Wright-Phillips. 31:41 Jamie Cureton takes a shot. Save made by Romain Larrieu. 31:07 Ryan Harley takes a shot. Save by Romain Larrieu. 27:14 Craig Noone takes the inswinging corner, Rory Fallon produces a left-footed shot from inside the area that goes over the bar. 24:35 Inswinging corner taken right-footed by Conor Clifford. 24:16 Onismor Bhasera takes a shot. Blocked by Richard Duffy. 22:08 Shot from just outside the box by Jamie Cureton goes over the crossbar. 20:54 Conor Clifford takes a inswinging corner to the near post, Steve Tully manages to make a clearance. 20:37 Bradley Wright-Phillips fouled by Billy Jones, the ref awards a free kick. Karl Duguid takes the direct free kick. 19:30 Bradley Wright-Phillips is ruled offside. Artur Krysiak takes the indirect free kick. 18:42 The assistant referee signals for offside against Ryan Harley. Free kick taken by Romain Larrieu. 18:04 A cross is delivered by Karl Duguid, Header on goal by Rory Fallon from inside the box goes harmlessly over the target. 16:44 Free kick awarded for an unfair challenge on Richard Duffy by Bradley Wright-Phillips. Free kick taken by Richard Duffy. 13:52 Billy Jones takes the inswinging corner, Header from deep inside the penalty area by Troy Archibald-Henville goes harmlessly over the crossbar. 13:00 Corner taken right-footed by Ryan Harley, Rory Fallon makes a clearance. 11:04 James Dunne concedes a free kick for a foul on Craig Noone. Direct free kick taken by Romain Larrieu. 7:19 Foul by Rory Fallon on Troy Archibald-Henville, free kick awarded. Billy Jones takes the direct free kick. 3:52 Foul by James Dunne on Rory Fallon, free kick awarded. Free kick taken by Onismor Bhasera. 1:41 Richard Logan provided the assist for the goal. 1:41 GOAL - Ryan Harley:Plymouth 0 - 1 Exeter Ryan Harley grabs a goal from just outside the penalty box to the bottom left corner of the goal. Plymouth 0-1 Exeter.